If you find that your office gets a bit too noisy at times, there’s too many distractions in one area or you simply need to divide off some meeting spaces but don’t want to carry out any major reconstruction work, then glass office partitions are your answer. Partitioning systems have increased in popularity over the past few years, and are being used in offices all around the world. The simple explanation for this is that they’re a quick, easy and non-disruptive solution to an office refurbishment. There’s many different types of reasons to install glass office partitions in a commercial/office building, as they bring a whole host of benefits to a working environment. Not only do glass office partitions allow a space to feel more bright, airy and open due to the increased transmission of light, but they actually create the illusion of more space. Even small office spaces sometimes need a bit of privacy and division, but it might not seem possible to do that without blocking off areas with some solid walls. With glass partitioning this isn’t necessary, and it’s possible to divide up the office without losing any space. Don’t suffer with an open plan office if it’s too noisy, disruptive and isn’t doing anyone any favours. Use glass partitions to segregate departments, divide employees and even create meeting rooms using all the space you’ve got to work with. The great thing about glass office partitions is that they can be tailor made to suit the space you have. They’re easily created to a certain size, and installed without any mess or disruption. 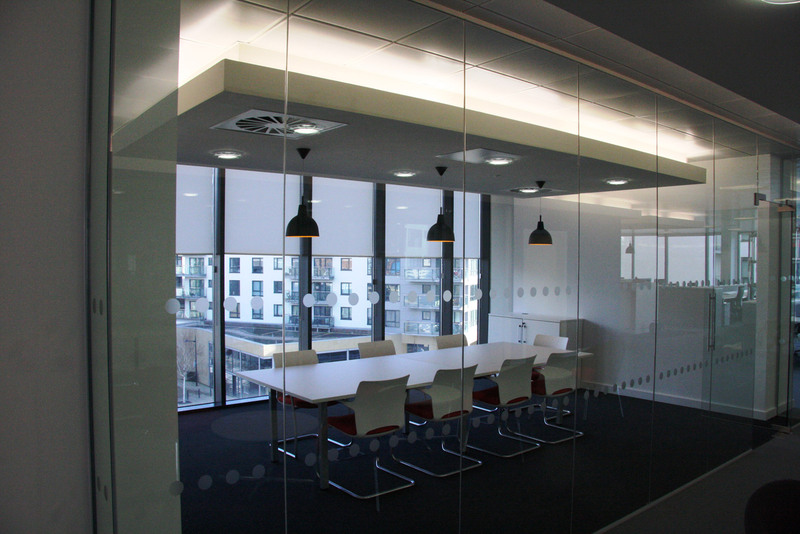 Glass office partitions are often used to divide meeting rooms, in order to add a degree of privacy. Of course, a full height glass room gives little privacy in appearance, but you can be sure that thanks to their soundproof qualities, the discussion will stay quiet. If you love the look of having a fully glazed meeting room to impress visitors, but want to add a touch more privacy – then why not add some stylish window blinds, or even look into our Smart Film Glass? Our glass office partitions are available in single glazed and double glazed, as well as framed and frameless. For more information on our glass office partitions, click here.